Piqua, Ohio, Sept. 20, 2016 – The Red Bull Air Race World Championship and Hartzell Propeller will be bring the exciting race series to the United States in October, for championship races in Indianapolis and Las Vegas as the series wraps up its international schedule. For the third consecutive year, Hartzell Propeller is the propeller technical partner for the Red Bull Air Race World Championship. 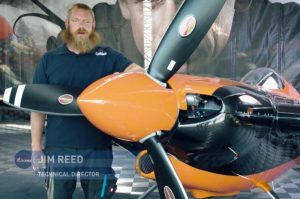 Hartzell provides its three-blade structural composite propeller known as “The Claw,” carbon fiber composite spinners, and lightweight governors to every competitive Red Bull Air Race team. Red Bull Air Race has released a video featuring its Technical Director Jim Reed explaining why Hartzell’s Claw propeller is the perfect choice for the very competitive and demanding air race circuit and why it performs so well for pilots flying fast split second maneuvers. For the video go to http://hartzellprop.com/tech-talk-race-plane-propellers/.